A fluffy shredded German pancake with a hint of cinnamon and topped with roasted Oregon Marionberries. Perfect for brunch, a special breakfast, or the holidays! Place frozen Oregon Marionberries in an oven safe baking dish and toss with maple syrup and vanilla. Roast in the oven for 20 minutes, until the berries have released some of their juices. Serve on top of Kaiserschmarrn! In a large bowl mix flour, sugar, cinnamon, salt, coconut oil, milk, and eggs yolks until well mixed. In a nonstick frying pan, melt butter over medium heat. Pour in batter and fry until cooked on bottom and is golden brown (about 5 minutes). Flip pancake and continue to cook on other side (about 1 minute). Using two spatulas, shred pancake into pieces and continue cooking for no more than another minute. 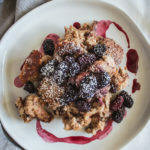 Serve Kaiserschmarrn topped with roasted berries. Dust with powdered sugar (optional). I like using high heat refined coconut oil (versus unrefined) in this recipe because it is flavorless. I’ve also used unrefined coconut oil but it will definitely add a strong coconut flavor to this recipe which isn’t my personal preference.